Hinatuan Enchanted River begins as an underwater spring that spouts freshwater from a deep source in the ground. The source of the water may be from aquifers surrounding the area that collect the water from heavy rainfall common in Hinatuan . The exiting water makes it all the way to sea snaking along its own river bed. The river is in the municipality of Hinatuan, in the province of Surigao del Sur. It is a five hour drive from Surigao City or a three hour drive from Butuan City. With better roads this year, it is now just a four hour drive from Davao City. It is already a tourist destination and has ample facilities like shaded cottages, restrooms and food stalls. It is managed by its own tourism staff. As it is with water springs, there is an underwater cave in its depths. Through past explorations of Mantaga Adventure Divers led by Dr. “Doc” Amores and Bernil Gastardo, they were able to find the cave entrance and initially map the cave area to a max depth of 87 meters. The most notable find was a good sized-chamber at a depth of 50 meters. 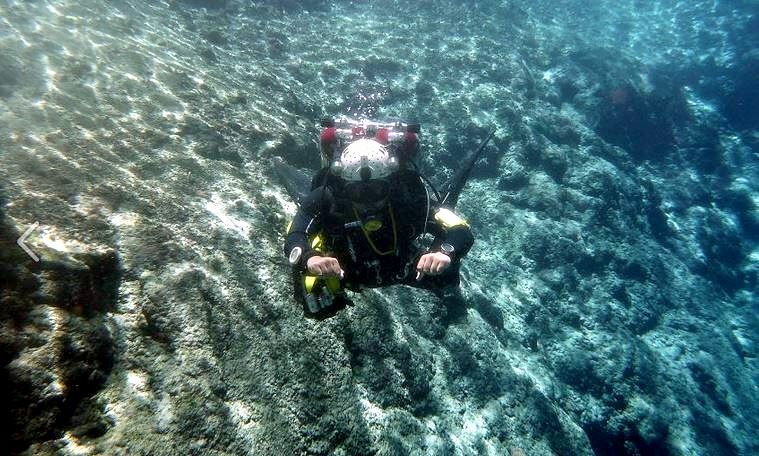 Diving deeper than 50 meters into a further passage is the realm of trimix gases. For any kind of diving activity in the area, one needs prior consent and expressed permission from the municipal government through Ferdinand Barrios. Mario Tecson of the tourism staff will inspect your dive licenses and let you sign a waiver. They are quite efficient to the point that they will reserve the nearest cottage for your dive group. For cave diving, the process is quite thorough but painless. You will also have to get in touch with cave pioneers Dr. Alfonso Amores or Bernil Gastardo for coordination of dive objectives. For this expedition our objective was to check the entrance which was inaccessible in 2011. After an easy setup at the cottage we all headed to the nearest ramp. I was Diver#1 and Ivar was Diver#2. Michael and JR were our standby rescue divers outside of the cave entrance. Dive#1 was made at high, slack tide. This was done to ensure easy access into the cave such that the flowing water from the spring would be slowed down by the rising seawater entering the mouth of the river. At least that makes sense in theory and proven so in past dives in the area. Diving to the bottom of the pool, you will see a large log that marks the split into a right and left lane to get to Doc’s Door and the entry point to Mayor’s Chamber. The right lane, called Bernil’s Crawl is a crawling descent to Doc’s Door. The left lane, called Patrice’s Way is an easier access, because it hugs a cavity on the left wall lessening the current flow. We tried entering through Bernil’s Crawl but there was substantial sediment deposit in the fissure, making the current flow faster than we can manage. We ended up switching to Patrice’s Way to get to Doc’s door. After hurdling some meters at Doc’s Door we were finally in Mayor’s Chamber. It took us 11 minutes from dive entry to reach Mayor’s Chamber. This chamber was previously measured by Doc’s team to be 37 meters long and 31 meters wide with a max height of 8 meters. This time more sedimentation on the bed made the bottom closer to the ceiling. There were several fish swimming with us inside the chamber. We also found two lines laid during Doc Amores’ second expedition. The lines and the steel bar anchors were almost buried by the deposited sand. 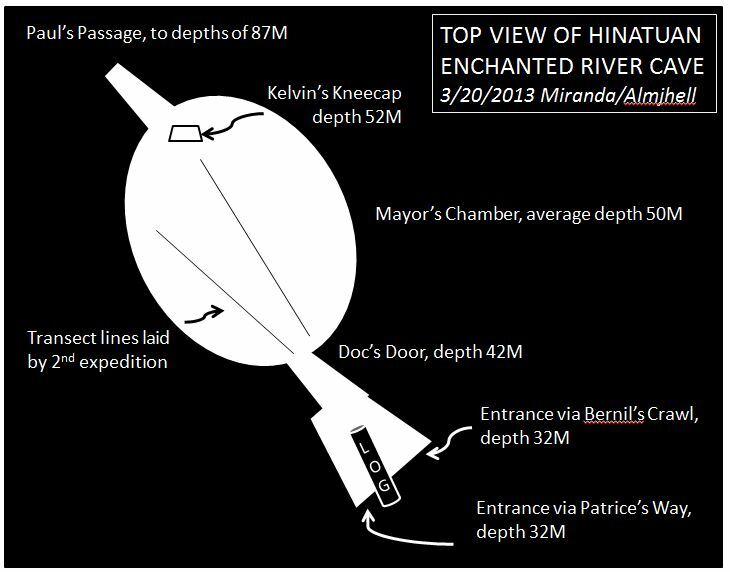 We then explored the chamber up to Kelvin’s Knee Cap which was at 52M depth, made our turnaround at 20 minutes and exited again through Doc’s Door and Patrice’s Way. We surfaced after a total dive time of 57 minutes. Dive Summary of Dive#1: Entry 11:12H, maximum depth at 51.4M, on 21%O2 and 50%O2 at 17M and 100%O2 at 4M. Exit 12:09H, 57 minutes. This time Ivar was Diver#1 and I was Diver#2. We made the dive on the descending low tide. We knew from previous expeditions that the current flow of the freshwater would be stronger with the absence of an opposing force-the flooding seawater. True enough the current was stronger. Even Patrice’s Way proved hard to enter. We were exerting too much effort and breathing more air than usual just to try to push into the cave. Ivar called off the dive right before Doc’s Door. We made a difficult exit as both of us were trapped on several wedged rocks. We did not have time to recover our reels. It was a humble retreat back to the main entrance. Dive Summary of Dive#2: Entry 14:44H, maximum depth of 39.0M on 21%O2 and 50%O2 at 17M and 100%O2 at 4M, Exit 15:18H, 34 minutes. There is an observed erosion of the surrounding limestone walls both at topside and underwater, possibly caused by swimmers in the pool, and tourism development in the area. The porous and softened limestone easily breaks off and then descends to the bottom. Most of this eroded rock gets deposited at the cave entrance. While Patrice’s way is still wide enough for divers to enter the cave, the pile-up of sediment in Bernil’s Crawl will eventually divert the water flow into Patrice’s way, thus making it harder to overcome the outgoing flow. Further erosion could amplify the current through the restrictions. We suspect that depending on the month of the year, one or both entrances could be partially blocked. The sedimentation is an issue for cave divers. While constant water movement and immersion will dissolve it through time, it will make the cave harder to access for cave divers. The entrance particularly the limestone sand and pebble bottom will always change depending on how the water flow will shape it. Thus the door to this nature’s wonder is ever changing. Thank you to Ferdinand Barrios, the tourism, planning, development officer of Hinatuan Municipality, and Mario Tecson, tourism operation assistant of Hinatuan Enchanted River Management, and to the discoverers of the cave, Mantaga Adventure Divers, led by Dr. Alfonso “Doc” Amores – NACD (USA) # 3042 and Bernil Gastardo – IANTD Cave Diver #95508, for their data from past three expeditions and their advice for our trip. i wonder why the water in hinatuan is salty? and there are marine fish living? if according to your diagram, water seems are fresh and it came from rains..
Hello Almar! The water that flows from the enchanted river is definitely fresh. And since the spring connects to the sea, during high tide the sea water goes into the sump and mixes with the freshwater. This allows certain marine species in the area to thrive on the mixture of salt and freshwater.